It has been almost a month since my English Channel crossing on July 7 and I wanted to write about my experience before I face the Catalina Channel in another 12 days and mix them up in my mind. I actually never thought I would swim the English Channel. But when I finished my swim around Manhattan in August 2017, I faced that well known post-race depression that affects many people after completing a big challenge. So I decided I’d fill that emptiness with the other two swims of the Triple Crown (the idea of the Continents Seven would come later in the year) and I booked my place for the Catalina Channel in August 2018 and the English Channel in August 2019, which is the earliest I could find. At the beginning of this year, I heard that Masterpiece had a cancellation for July 2018. I was already training for cold waters and slot #4 sounded a bit risky, but I decided to call the odds. I kept taking down my swims around the world one by one – Haiti, New Zealand, Australia, South Africa, Bolivia and all over the USA – but I could not stop thinking about the Channel, and how special it would be. As the date approached I put together the best team one could ask for: my South African boet Mike, who had witnessed my Manhattan swim, would again fly all the way from Johannesburg to orchestrate it all. My buddy Tomas, who was never a swimmer, would fly from Spain to be there too. My cousin Guille would fly from Germany to document everything through his camera lens. And Johana would again suffer next to me, from the boat. The last addition to the team, South Africa’s Chris, proved to be key too, as he swam with me when I was struggling the most. If you think that Open Water Swimming is not a team sport, do a 40km+ swim and you will change your mind. I absolutely could not have achieved this without the help of each of my team members – so thanks a million, you guys! The weather during the week of our window was actually great. Sun was out (in the UK! ), winds were moderate and the Mardle’s from Masterpiece told us to stay ready. We only got to Dover on July 5th so we barely had 24h to adjust before facing the channel. Slot 1 went out and finished, Slot 2 went out and didn’t, and I got the green light to start on Friday night, around 3am. Time didn’t bother me much, as I had also done some night swims and watching the sunrise while swimming is really cool. We were staying at a lovely house by the cliffs, facing the Channel, and we had an amazing braai (South African for barbeque) on Friday afternoon. Then we went for a quick nap and alarm clock went off at 1am. We had everything ready and headed to Folkestone, a town nearby where Masterpiece was towed. It took us a while to meet the observer, to board the boat, and to be taken to Shakespeare Beach, so splash time was finally 4.21am. Friday nights used to be quite different during our time in college in the UK: had you told Mike and me 12 years ago that we would be spending a Friday night swimming the Channel, we would have laughed so hard! The start of the swim was incredible. I wore the light glow sticks for safety but it was already pretty clear. Unlike the other swims of the Triple Crown (Manhattan, Catalina), no kayak accompanies you (I am guessing because sea can get pretty rough?) but given the size of my team on the boat, I never felt I was swimming alone. 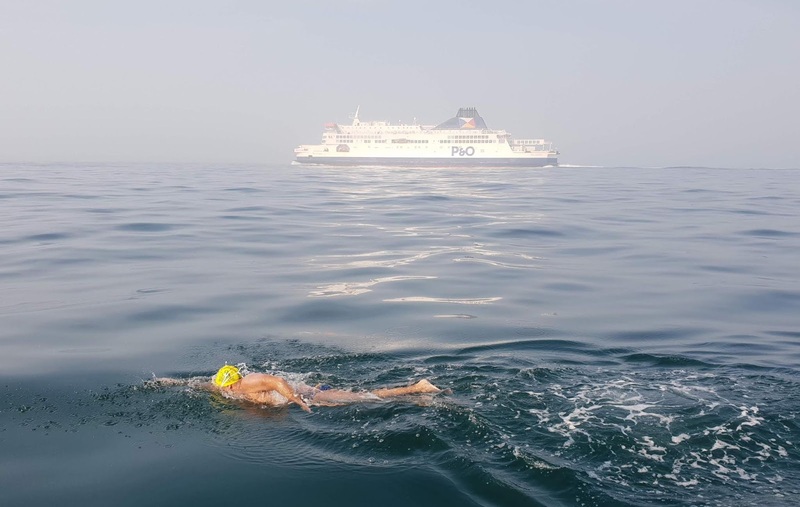 It was a bit hazy, but sea was pretty calm and I was feeling great – strong and focused. My first feed was a disaster. The day before I couldn’t find Gatorade in the supermarket so I took what I thought was the UK equivalent, Lucozade. I didn’t even look at the label or try it before the race so I just assumed it’d be fine – I was wrong. It took me by surprise that it was sparkling and with a strong flavor. It was my first feed so I forced myself to take at least half the bottle, but this made me have nauseas for the following two hours. I am not a person to vomit during my swims, but that drink got me very close to it. I stuck to water and bananas after that and I started to feel good again. I had taken down 8 miles in the first three hours and the occasional jellyfish stings from tentacles weren’t going to stop me. When I stopped for my 4th feed (i.e. 5 hours down), Mike told me we were right in the middle of the Channel and that we were on track for a sub-10h swim, which was my goal. Just like in Manhattan, Mike spent the whole swim shouting at me and keeping me motivated. He’d be a great coach if he ever quits as a banker! I had a peanut butter bar (reward for reaching the middle of the Channel) at that feed and started to swim again. Jellyfish wouldn’t stop coming at me and I started to feel a bit tired. My stroke rate was probably down to 53 (compared to my target 60) at that point. Mike saw it and invited Chris to swim with me for the permitted hour. I was not a big fan of pace swimming until very recently, when I had good experiences with Rondi of NYOW in the various bridge-swims. So I welcomed the idea and he jumped in at 10.21am. In his younger days, Chris had been a pool swimmer in South Africa (with some of the guys I swam with in Robben Island in April, small world!) and he clearly still had it. It was such a booster to swim with him and looking at something different than P&O boats, cargo ships and jellyfish, and I was sad to see him leave an hour later. But I started to see French land (not that I was sighting) and I felt it closer. We just had another 8 miles to go, and I would be done sub-10. Boom. For anyone reading this, you have to remember that that’s the toughest part of the swim. Currents around France are very strong, and you have to fight hard if you don’t want to pass the lighthouse at Cap Gris Nez. That is the most common landing point (as opposed to Calais), and if you are taken to the right of the lighthouse (as you face it), you will add three more hours to the swim just to be able to come back to it. Go have a look at the S-shaped swims, and the difference between a 9-11h swim and a 14-16h swim. So, I stayed focused and swam hour #7 to #8 at a good pace. Chris jumped in again at hour #8 but couldn’t keep up with me, and returned to the boat right away. I was flying! But then the mother of all the jellyfishes came to visit me. I felt it stuck to my left shoulder and burning my neck while another one was stinging the right side of my stomach. I grabbed it and threw it away and started swearing in Spanish so loud that some French people may have heard me. I normally don’t say I have been stung not to worry the crew, but this one was nasty. I removed my cap for my neck to breath out, and kept on swimming. France was closer but I wasn’t finishing quite yet. My stroke rate went down again and I was told 3 times there were 2 miles to go – which means we were being pushed right and were swimming in parallel to the coastline. My goal of swimming sub-10h was gone but God knows I was going to reach that darn French lighthouse. Sun was still shining and I started dreaming of landing on a sandy beach to lay down looking at the sky while taking a French pebble to take home. I was wrong again. I watched the boater and the observer getting onto a smaller inflatable boat and I started to follow them. There was no sand whatsoever and I could only see sharp rocks to get to. Oh-oh. I left the boat behind and touched the rocks but I knew I had to clear the water. After you have been swimming for 11 hours in salty water and stung repeatedly by jellyfish, your coordination is nonexistent. Waves weren’t too strong but they washed me a few times against the rocks before I could actually step on one and raise both my arms. I heard the boat’s horn and the shouting of the crew – I was officially a Channel Swimmer. When I came onto the boat again I was a real mess – I was bleeding out from the rocks, deeply stung, and completely knackered from the swim itself. 11h04’, just four minutes longer than my END-WET. People ask me if it has been my hardest swim yet, but I still think Titicaca was tougher due to the lack of oxygen. Each one of my Continents Seven swims has been interesting so far: super choppy in Australia, super cold in South Africa, super high in Bolivia, and super jellyfishy in the Channel. It took me a few days to realize what I had done, by becoming the 1,850thish person (17th Spaniard and 2nd Canary Islander) in history to have swum between England and France, and with a great time. There have been some work changes at home and the post-race depression showed again, so I’ve had to fight hard to keep swimming every day, and to stay focused. On August 15 I will be traveling to Orange County to face the Catalina Channel, almost the same distance of a swim, just during the night and with a slightly different marine life. If successful, I will be the 190thish person, 9th Spaniard and 1st ever Canary Islander to finish the Triple Crown.